The DuroPro line is a color version of the Cooperstand Ecco-G stand. Mapex announced two additions with the B1000 Boom Stand and S1000 Snare Stand. Elastick mini is a musician's iPad holder product designed to clip the tablet to a mic clip on a stand. BandStorage.com, a subsidiary of A&S Crafted Products, announces the release of its new Band Room Cello Rack. 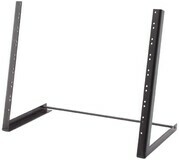 Guitarstorage.com are now offering their new "Short" Studio Racks. Crown introduced the VRACK amplifier management solution, an amplifier management rack system solution.